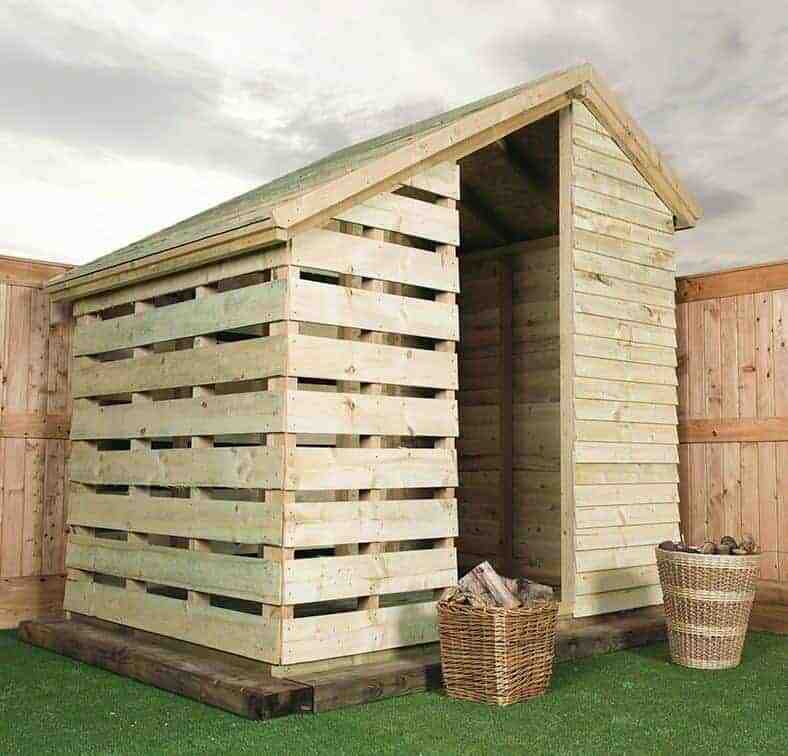 Firewood Storage Shed - Who has the best? 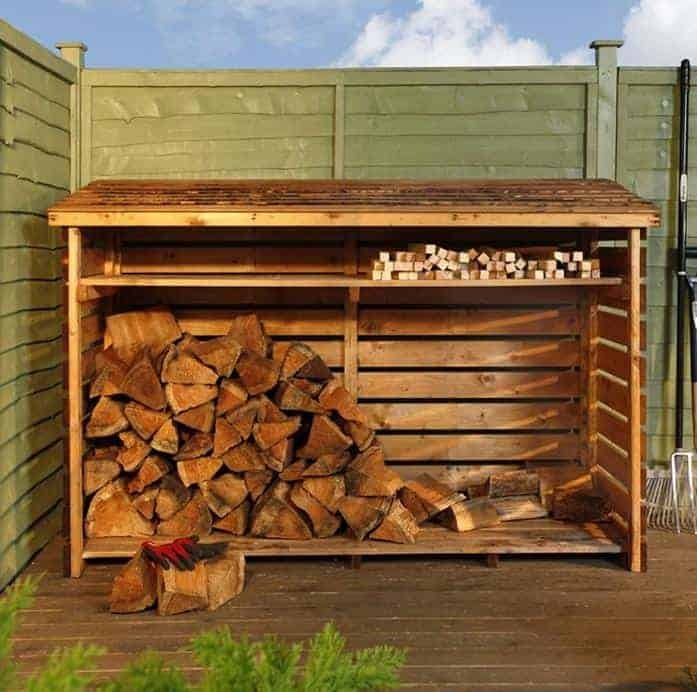 Firewood storage sheds are becoming increasingly popular in gardens across the United Kingdom, in fact for many people they’ve become an essential addition, as much part of their garden landscape as a 6×4 shed or a timber seat. 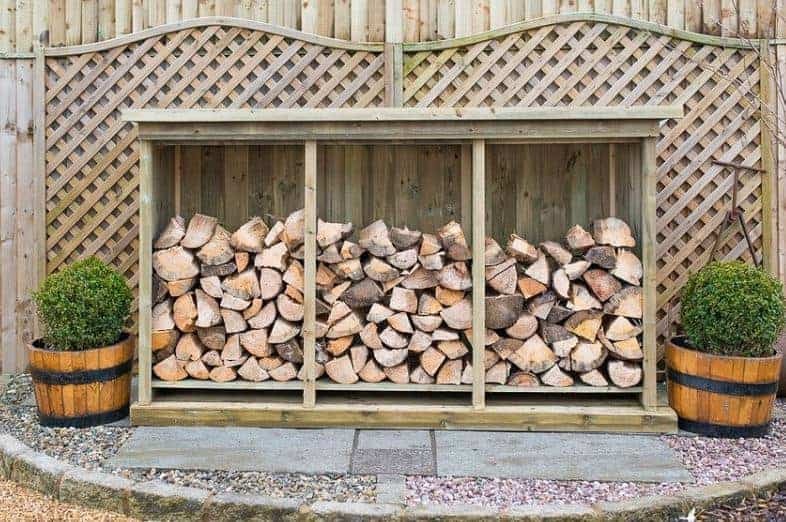 The main reason that firewood storage sheds and log stores have become so sought after is that increasing numbers of people are turning to logs to heat their homes. That’s hardly surprising, as using logs and firewood as a solid fuel is a much more environmentally friendly way of heating a house, and of course that means that it can save money on power bills as well. 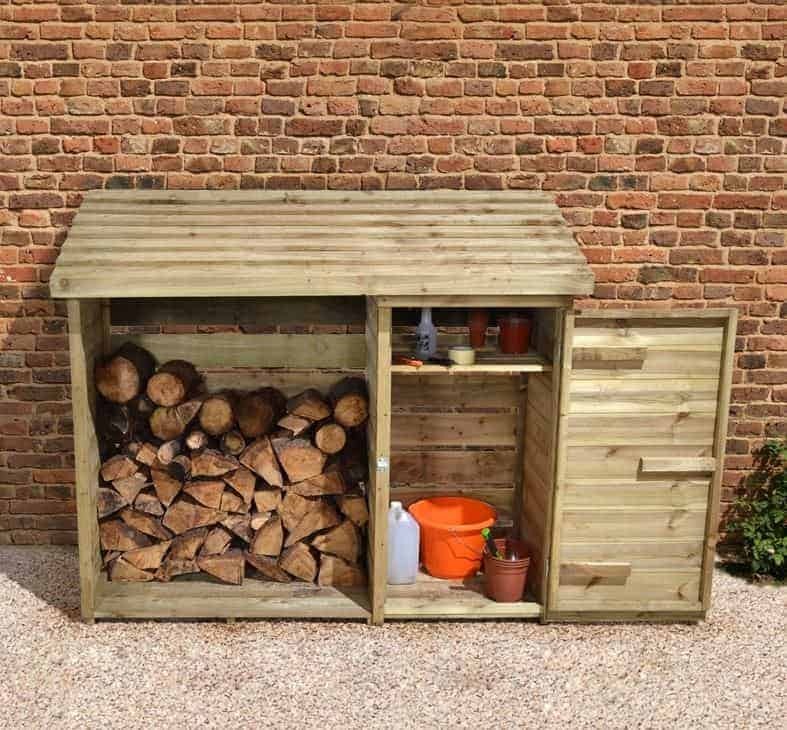 If you have a log burning stove or fire, or are thinking of getting one, then be sure to take a look at our WhatShed guide to the top 20 firewood storage sheds currently on sale in the UK. 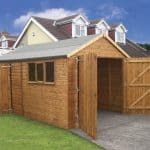 Just how did we select the top firewood storage sheds? A lot of factors were taken into consideration. 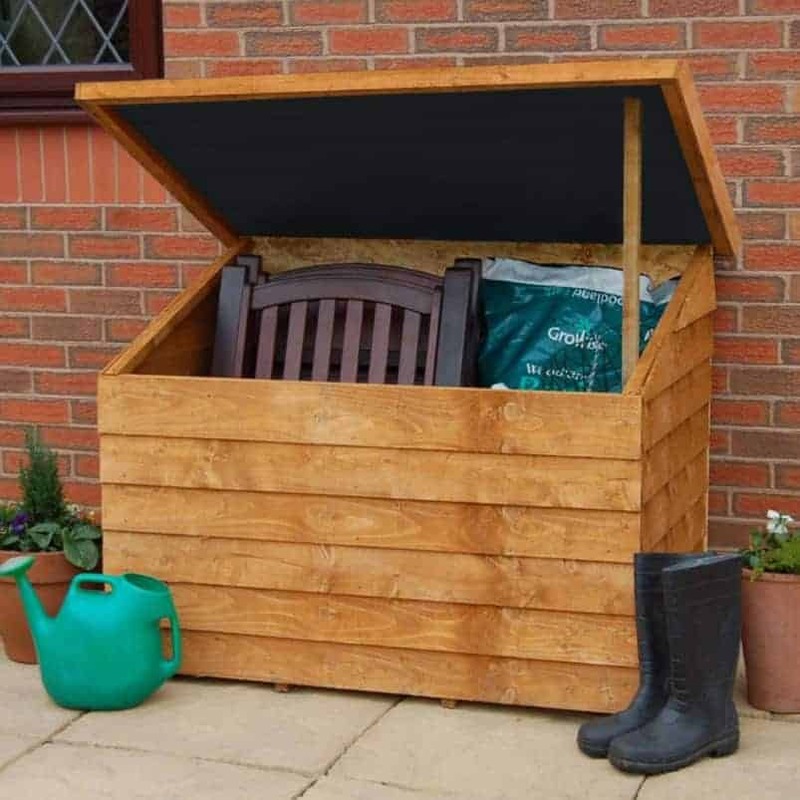 These included storage capacity, ease of use, any unique design features, durability and longevity, and appearance – after all a firewood storage shed will sit in your garden all year long, so it’s important that it has an aesthetic appeal. 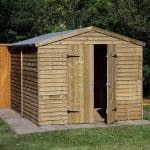 We also considered the price of course, so you’ll find firewood storage sheds to suit all budgets. 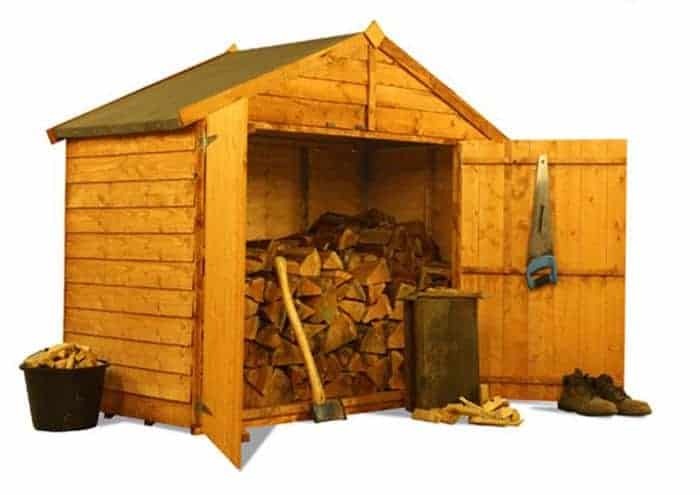 A hearty and well deserved congratulations then to the single midi log store with door from Rutland that takes the number one spot in the WhatShed league table of the 20 best firewood storage sheds in the UK. 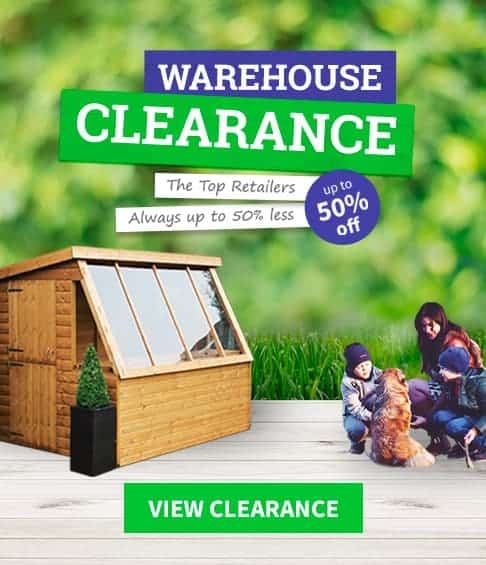 Whatever kind of garden building you’re looking for, and in whatever material, WhatShed will continue to bring you the reviews that can help you make an informed choice. 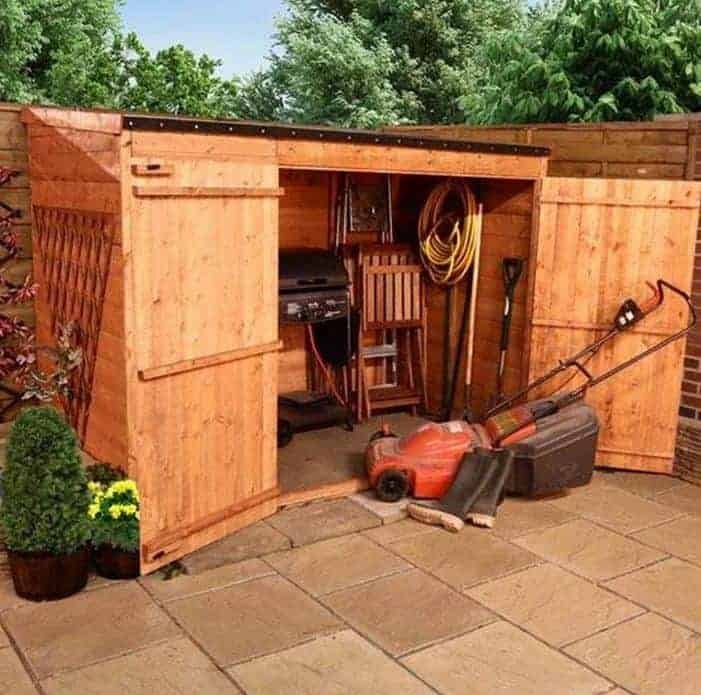 As we’ve seen, a good supply of fresh air is an important feature when it comes to firewood storage sheds, but this doesn’t mean that weather protection can’t be offered as well. 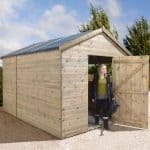 This log store provides the best of both worlds, and is also much wider than we usually see, which is why it has it’s deserving position at the beginning of our top 10 log storage sheds in the UK. The front is fully open, which allows for natural ventilation, and yet the sides and back, and the pent roof, are all fully boarded which prevents rain from getting in from all but one direction. The pent roof also provides a generous overhang at the front as well, giving added protection against rain and snow. Along the front are two supporting struts which are also linked to the integral floor joists, and these are needed because of the almost unique width of this firewood store. This width of 2.14m is also supported by a depth of 0.84m and a height of 1.25m, so it’s possible to keep a lot of logs in optimal condition inside this store. The timber is certified to come from renewable sources, which is a welcome touch, and it is also pressure treated so it should be durable and rot free for years to come. 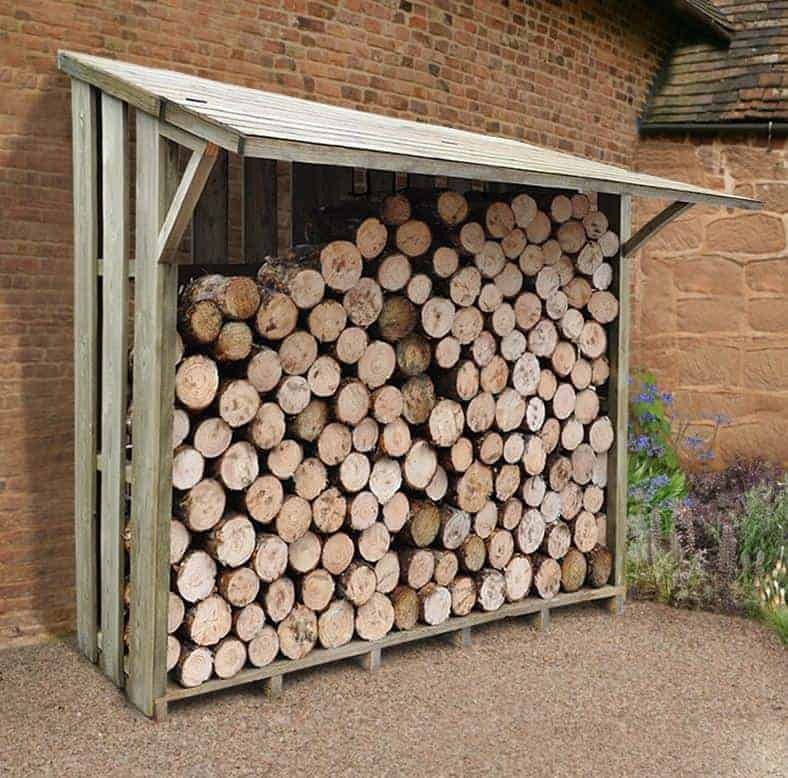 This isn’t the cheapest firewood storage shed we’ve seen, but if you want a lot of space this could be just what you’re looking for. This firewood storage shed has a unique design in that it’s triangular in appearance, and that really helped it to catch our eye. 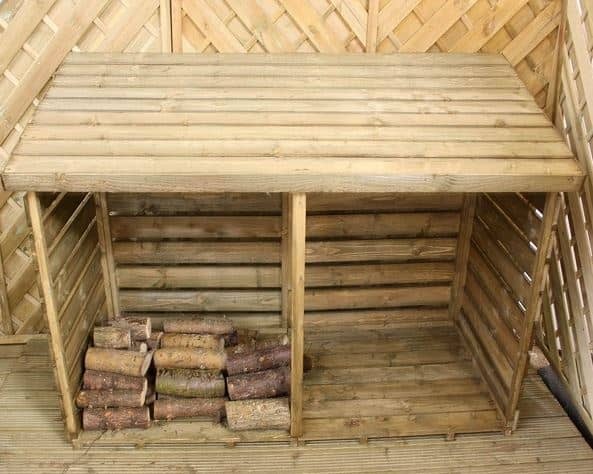 We feel that it could become a real talking point for any garden, and it will be an ideal complement to a timber garden shed for people with log burning stoves. 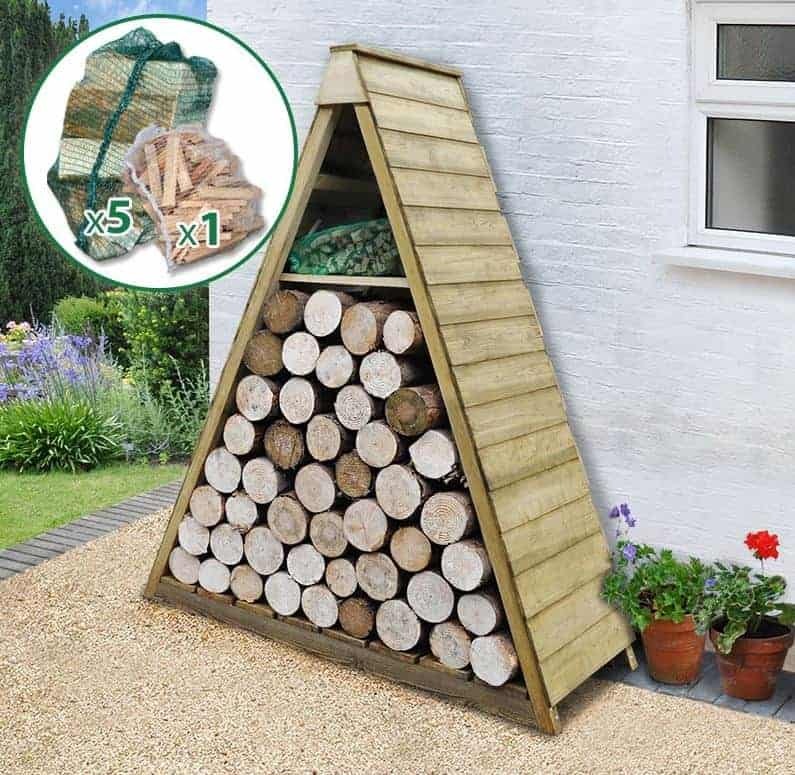 It also provides added value, which is something we always like to see, when compared to other firewood storage sheds because it comes complete with a firewood starter pack which includes five bags of logs and a bag of kindle. 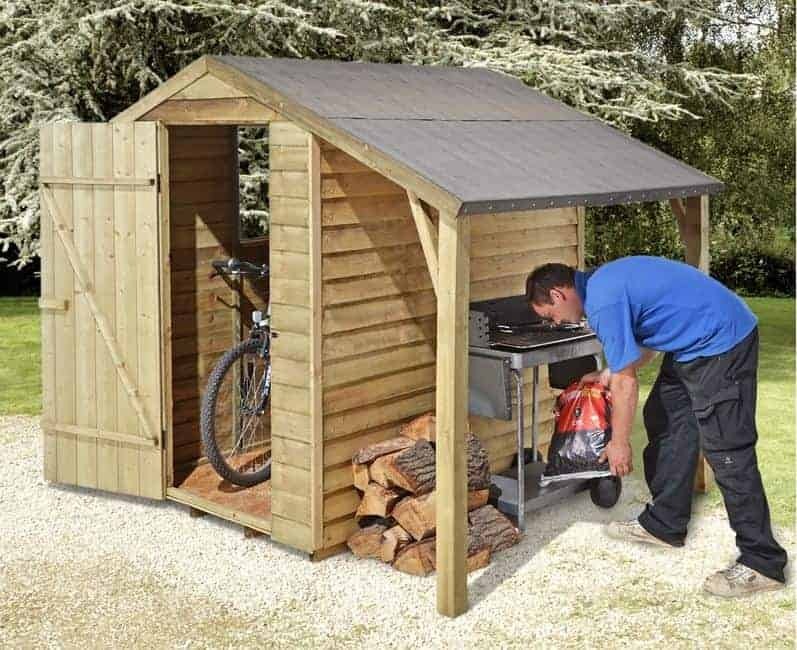 Another feature that we liked about this good value firewood storage shed is that it has two distinct sections, so the smaller section at the top of the triangular frame is ideal for keeping kindle dry. With an open front there’s plenty of ventilation, and with the 12mm shiplap cladding being pressure treated there’s also a 15 year warranty against rot which is as generous as we’ve found on the timber log cabins we’ve reviewed. 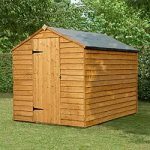 Although the base measures 1.52 X 0.61m, the overall storage space is much lower at the peak thanks to its original design, and so this is the only factor that prevents this stylish garden structure from being ranked higher in our list of the top 20 firewood storage sheds. 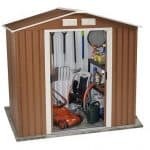 We found this to be a very well constructed and highly attractive firewood storage shed, and yet its price tag and treatment requirements stopped it climbing higher up our firewood storage shed league table. Being made of Scandinavian Redwood it’s an environmentally friendly log store, which we know that many people who use firewood and logs for their fuel will appreciate. 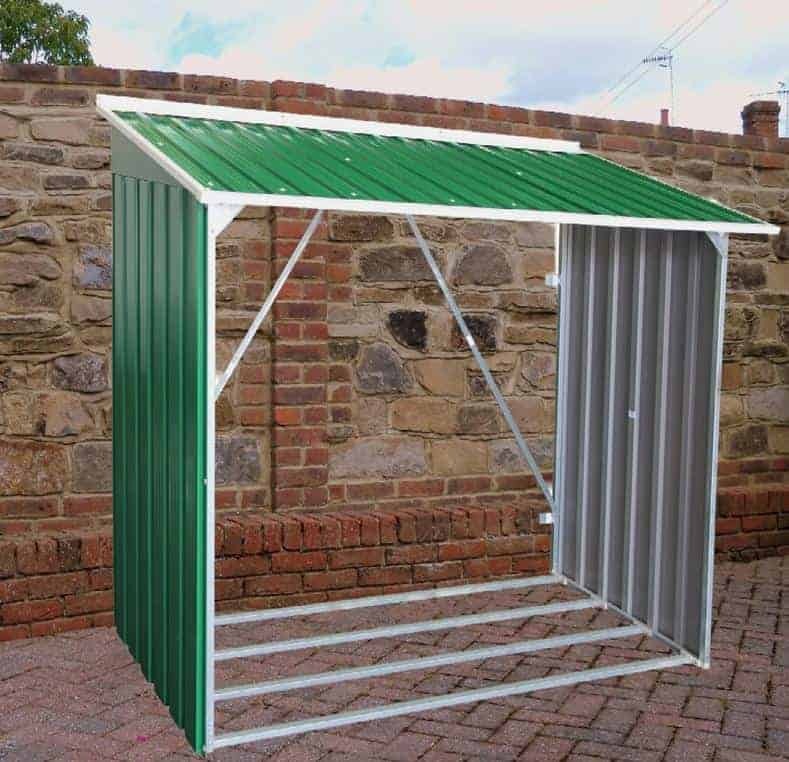 It has a solid boarded pent roof, and solid sides and a back, so with careful positioning it can achieve a good level of protection against rain. It also features floor joists to protect the slatted floor and the logs upon it from the ever present threat of ground moisture. Ventilation is provided via an open front, and by two panels cut into the back wall. 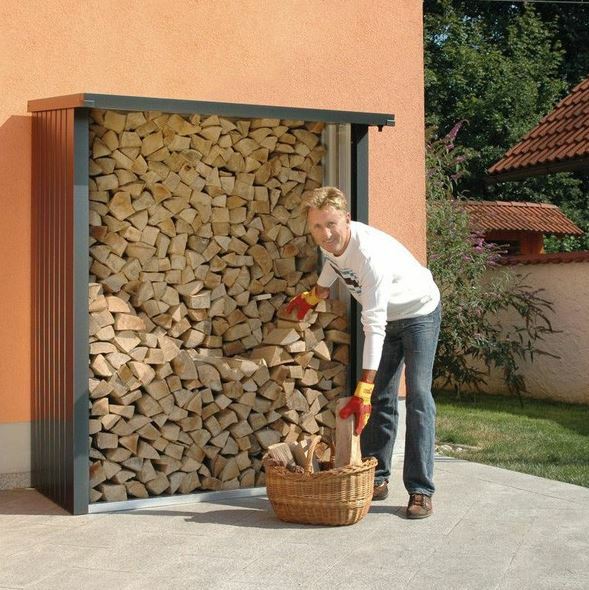 This is a unique and useful design feature, as it helps firewood dry out very quickly. We also liked the integral shelf at the top of the store for kindling, not something that we often see in firewood storage sheds. One downside to this firewood store is that it is untreated, so the customer will have to apply wood preserver immediately after installation. 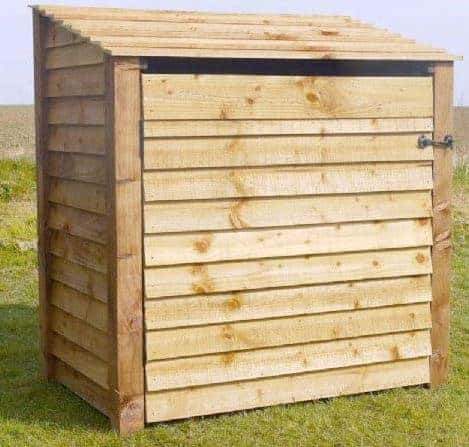 Nevertheless, we feel that this good looking garden building deserves to be counted in the UK’s top 20 firewood storage sheds. This is certainly a contrast to the last firewood storage shed, as we now move from the budget end of the market to the luxury end. This is large in every sense of the word, from the price tag to is width, depth and height. In fact its rain deflecting apex roof has a ridge height of 2.70m, approaching nine foot, is by far the largest of any firewood storage shed that we’ve seen. 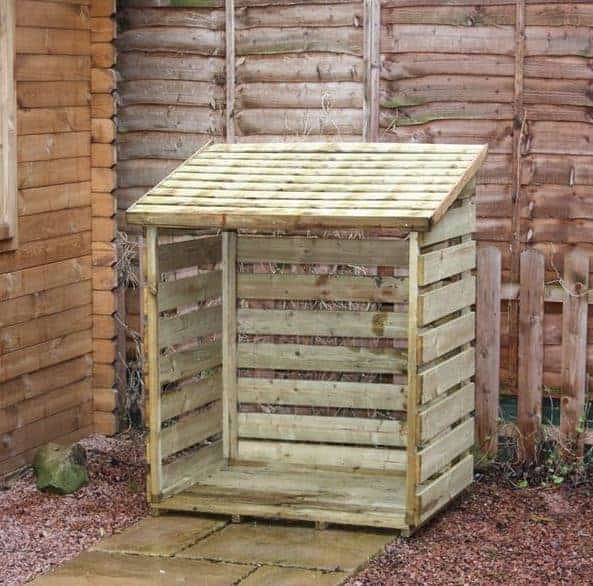 It also has a width of 2.40m and a depth of 2.40m as well, so this really is the firewood storage shed for people who need a large capacity. 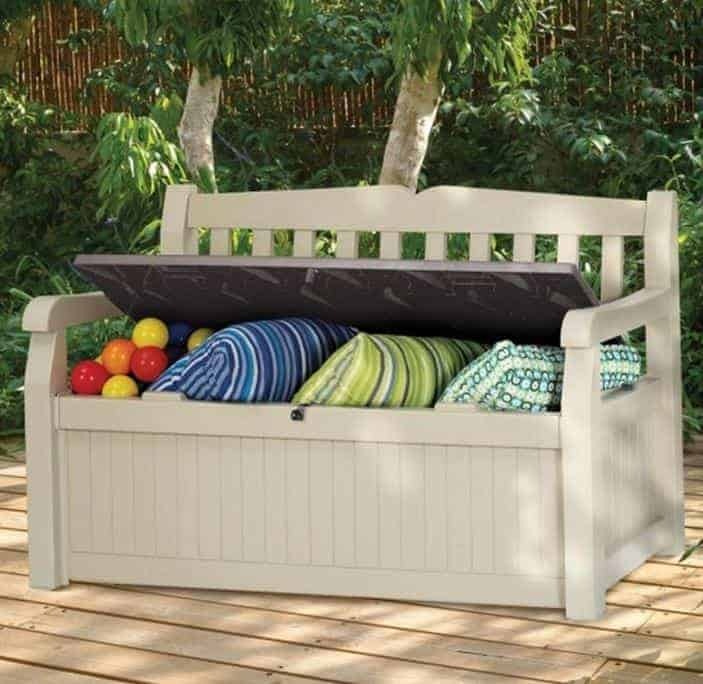 What we really appreciated besides its huge storage space, is its unique and very attractive design. One half is fully boarded with sustainable spruce timbers, while the other half is open slatted, which means the the firewood storage shed has both weather protection and the ventilation that logs need. It’s also very tough, thanks to the 38 x 98mm frame which again is the thickest that we’ve seen. 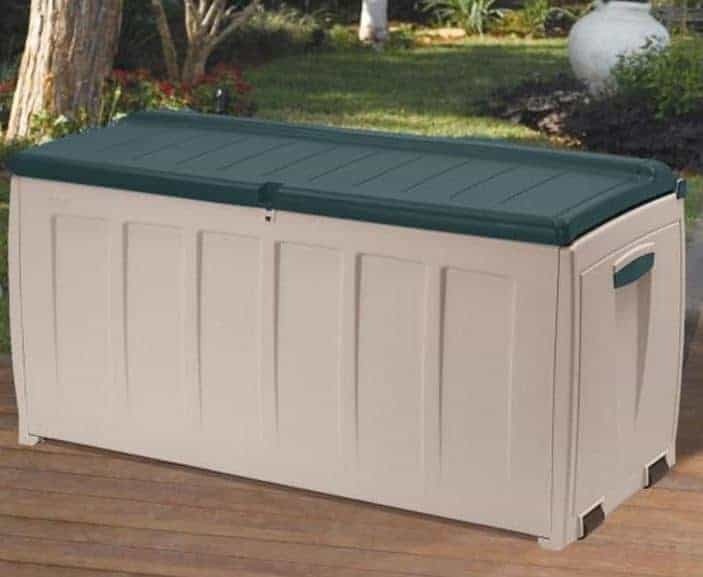 The only thing that stops it being ranked much higher is its asking price, which is substantially higher than any other firewood storage shed in our top 20 table. 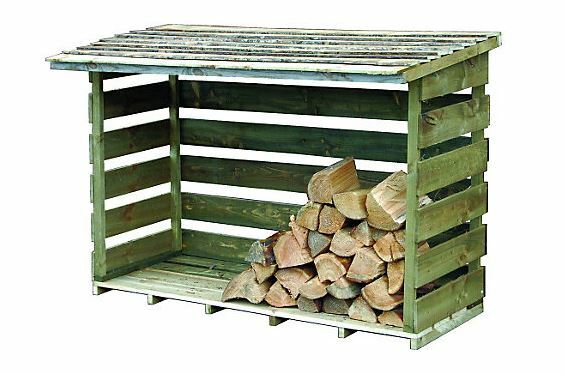 If this comes within your budget however, and you need a large supply of logs to hand, then it’s a firewood storage shed that’s hard to beat.